This past Saturday, I made my way down to Wrigleyville in Chicago to catch up with Kevin Starrs, frontman of the UK's Uncle Acid and the Deadbeats. I was lucky enough to see them live at their very first U.S. performance at Marlyand Deathfest XII two years ago. But considering that they are still relatively new to touring the states and their new album "The Night Creeper" is fantastic, all signs pointed to seeing them play live again as being a good move. 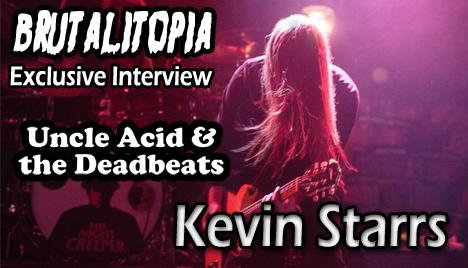 In the short but sweet interview I had with Kevin, we chatted about the band's current tour, Uncle Acid's sound and imagery, and the band's anonymity. Check out the interview after the break!